too short for fretting over mountains either. There is much too be thankful for and much to embrace. Start now. of breath, a soft ‘no’, and a heavy heart. event in which I religiously participated. She was bright and sunny and clever. She sent me lovely white cloth napkins (I’ve used them in the photo above) just because. And she was fighting cancer. woman, Meeta’s Monthly Mingle, hosted by Jeanne, is celebrating a Taste ofYellow one more time. meat, or simply break apart with your fingers. Separate the 100 grams from the rest – this will be your topping. have set aside for topping!) to the pan and sauté until just cooked. in the cooking, season to taste with salt and pepper. stick blender until everything is smooth. Alternately, you can pour the cool soup in a blender and blend. also be fantastic with chorizo as well. always showed me, and the many others whose lives you touched. Hugs, Joey. I hear you. Hi Rosa, I know, so sad indeed…she was a wonderful person. I too have lost a blogger friend and the sadness that comes with the knowledge is surprising given how tenuously our relationships are built. Your friend Barbara must be in a better place now and cooking up a storm. i have just discovered your blog, and not only are your recipes mouthwatering…but your writing is interesting and personal. this is a beautiful blog post, I felt very touched by it. Hi Bom — I am sure she is, thanks for your words. It is indeed incredible (and wonderful) how the internet has allowed us to have such real connections where otherwise space and time would have not allowed! I heard about Barbara…I didn't know her, but from what I can gather, she is a well-respected blogger. Your soup is genius! And yes! bring on the longganisa crumble topping! Ooh yeah! Sarap! I am just in total awe of your blog. The colors are so soothing. Love your header. Hi Jen — she was truly an awesome woman 🙂 I really like the flavor the longanisa adds to squash soup! A beautiful tribute – and such true sentiments! We a;ways waste time complaining about the silliest things and when something like this happens, we realise we have nothing to complain about at all. 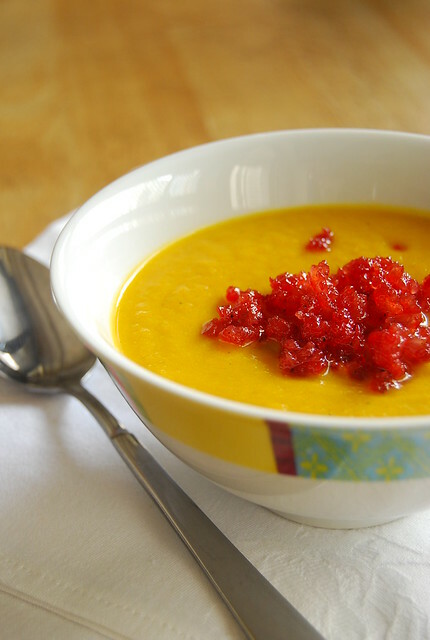 A beautiful and vibrant recipe – thanks for joining the Mingle this month to pay tribute to Barbara! It's nice you were able to include the napkins Barbara sent you in the post. Delicious-looking soup. Thank you Jeanne for organizing this event…Barbara definitely touched a lot of lives and that legacy won't be forgotten! I love squash soup! I usually make it vegetarian with an added malunggay leaves for color (which I posted in my blog). Thanks for yet another inspiration. Hi Cath! I never though of adding malunggay! I will try that next time 🙂 Thanks for the tip! Great post and recipe. Beautifully written, honest and personal.